Polish design practice 8+8 Concept Studio are attempting to reach new architecture and construction feats - proposing plans for an underwater tennis court. 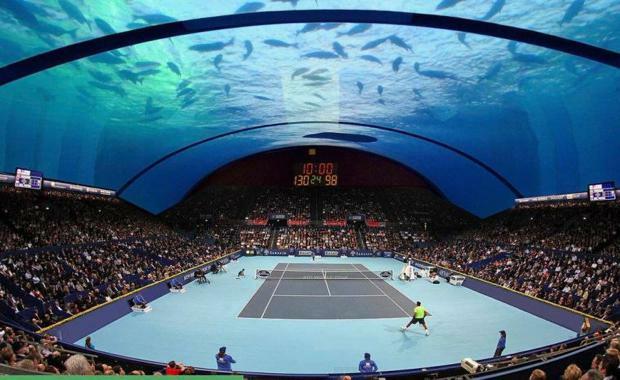 Planned to be built off the coast of Dubai, the architect has drawn up plans for a tennis court to be built underneath a huge glass roof that would be thick enough to be safe while still being able to view the marine life. It's not surprising Dubai was the location of choice, as the city is no stranger to tennis-related innovation being home to the world's highest tennis court. Engineers have however already called into question the feasibility of the development, which would not only be extremely difficult to execute but also very expensive. While the possibility of this project is unlikely for now, the pictures are incredible.